When the street vendors of Beijing start selling sugar-coated hawthorn and people are wearing face-masks even on a crystal clear sunny day just to keep warm, the Beijing winter has come again. Goodbye fashion, hello Chinese military-style down coats, fur hats and multiple-layered thermals! 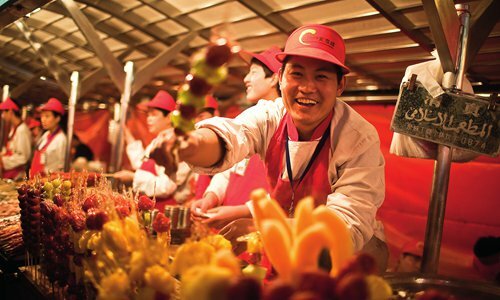 This year, the frosty season has captured China's capital earlier and fiercer than ever. Officially, winter has arrived in China after five consecutive days of temperatures below 10 C on average. November 1 to 5 have already reached this standard. Then, December came with icy winds and freezing temperatures of -10 C, so the Beijing meteorological station issued several alerts. Another feature of this Beijing winter seems to be the haze that has kept residents indoors for a number of days already. Despite the cold wave, Metropolitan reporters hit the city streets to ask whether Beijing residents love to snuggle by the fireside after an ice-skating afternoon or suffer from winter blues. Beijing residents like to wear multiple layers of pants to feel warm when it's cold outside. Keeping the legs warm shall avoid arthritis and rheumatism later in life, according to traditional Chinese medicine. Long johns and thermals come in all varieties, simple cotton ones, heat-tech, woolen, quilted, you name it. But what about those who grew up in other, perhaps warmer parts of China and the world? Have they adopted the Chinese winter habit of wearing thermals while living in Beijing? Long-time expat Keeran from London, the UK does not like to wear thermals, even when the temperature drops below zero. "I tend to tough out the Beijing winters," Keeran told Metropolitan. "I've got 14 of them, so I've gotten used to the cold." Even though the young dad doesn't like the "feeling" of long johns, his 2-year-old daughter wears two pairs of pants. "When it gets colder, we'll be layering her up even more. She needs to keep nice and warm." A young Chinese surnamed Shen from Shenzhen in South China's Guangdong Province came to Beijing on a solo tourism trip to experience winter in the north. He bought some thermals, but isn't wearing them, instead he wishes for even colder temperatures. "When I got on the airplane in Shenzhen, I was wearing a simple shirt, as temperature was still above 20 degrees. Once I got out of the airplane in Beijing, the cold hit me with minus degrees," he said. Wang Zixin just underwent an even more drastic temperature change. The local Beijinger has chosen Australia as her adopted home. She chose to visit friends and family in her hometown Beijing while it's summer in Australia. "I haven't been home for five years. Even though we go to the coldest place of Australia to ski quite often, the coldness of Beijing shocked me this time," she said. "So I wear lots of layers to fight the cold." 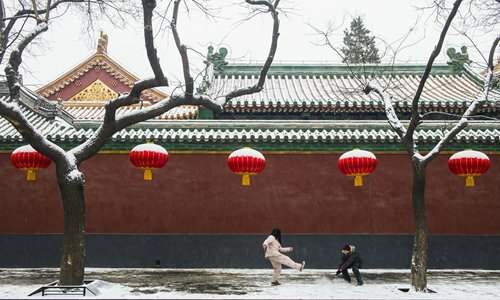 Except for the hazy and smoggy days, the Beijing winter could be perfectly picturesque: Sunny blue skies, frozen lakes,frosty flowers on the windows, and the crimson red historic buildings in Beijing that match with Beijing's popular winter snack, a sugar-coated hawthorn, the Tanghulu. There's only one thing missing: snow. The first snow in Beijing this winter has not come yet, so when will snowflakes finally cover the city? Shen, who came all the way from Shenzhen just had to experience the winter here, and hopes that he'll be able to witness snowfall. But the dry and windy climate of the Beijiing-Tianjing-Hebei region won't make his dreams a reality. Shi Hongbo, the head of the climate prediction office at the Beijing Climate Center, told reporters on the Chinese weather website tianqi.com that based on the average climate data, the first snowfall in Beijing previously occurred on November 29, with this winter being comparable late. "I tell my friends that the main difference between winter here and my home of Pennsylvania is that there is no snow in Beijing," said Spencer. The 24-year-old American works at a private English school in Beijing and has only one word to describe Beijing winters: freezing. However, Spencer has the perfect remedy for the cold by taking notes from the locals. She got herself a down quilt that she attached to her e-bike, so her hands, arms, and legs feel warm and cozy during the ride. 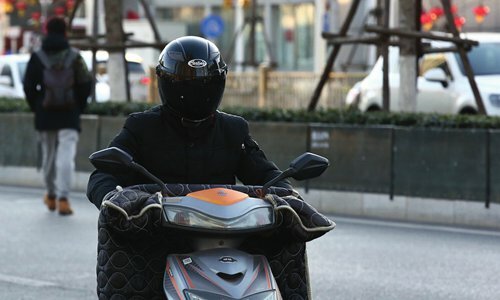 Is it a must-have for anyone riding a scooter in Beijing during wintertime? "You absolutely would not be able to survive the winter without one," Spencer said. On the other hand, she still hasn't got used to wearing thermals like the locals. "The teachers at my school yell at me constantly because I am not wearing multiple layers of pants," Spencer said. "This last week it got cold enough that I gave in." During the cold season, people are especially prone to seasonal affective disorder, or the winter blues. According to Psychology Today, 10 million Americans suffer from it each year. The online magazine states several theories that could explain the phenomenon. In winter, it gets darker sooner, melatonin production increases in the body, which makes people sleepy and lethargic. Also, being exposed to sun less often, the body produces less Vitamin D in the winter. Vitamin D deficiency is associated with symptoms of depression. "If you are already feeling down, the winter is not going to make you feel better. It prevents people from going outside," Spencer explained, saying that people in Beijing may experience the winter blues too. Traditional Chinese medicine also has some good tips to feel better in the winter, where less sun, darkness and sometimes haze can affect people's mental and physical health. The Chinese weather website tianqi.com recommends its readers go outside less, wear masks, drink more tea and water, supplement with Vitamin D and calcium vitamins, and enjoy a light diet consisting of more vegetables and fruits such as snow pears. Oliver from London, the UK, came to Beijing on a business trip. The weather took him by surprise. He describes London winters as "usually rainy and gray." In Beijing there is "at least" blue sky and sunshine. The sunshine encourages him to leave the hotel room and enables his skin to produce enough vitamin D that help fight off the winter blues, which he is usually prone to in London, where he prefers to stay inside. "I recommend wearing more than one layer when you go outside in Beijing," he said. "But to be honest, I don't own thermals."